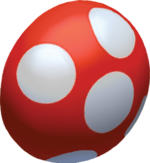 The Mushroom tires are a set of unlockable wheels in Mario Kart 7. As their name suggests, they are wheels that are shaped and colored like mushrooms. Their best strengths are their speed and handling, while their acceleration, weight, and off-road are hindered. These are the only wheels in Mario Kart 7 that do not return in Mario Kart 8. The icon, as it appears in-game. The Mushroom tires equipped with the Pipe Frame. This page was last edited on March 15, 2019, at 14:11.